This is a hard post to write and it’s hard to know where to start and so perhaps I’ll start at the beginning. Not my beginning or Quentin’s but perhaps at school’s beginning. Early on in Quentin’s Montessori 3-6 classroom time, we decided that he should remain home one day a week. There were many reasons. He was a preemie and still tired easily napping long periods (even now at 6!). He was bright and needed some focused one on one time to give him the attention he craved to fuel his insatiable appetite for knowledge especially in language and culture. But, truth be told the real reason is I loved it and I’m grateful and ever mindful that we are privileged enough to choose not only how much we work outside the home but we also choose his schooling. Early on Quentin identified it as our Nature Day. One day a week (Mondays) that we followed the child completely. Not having to be anywhere. A whole day of “yes”. You can read about our Montessori day at age four here. Not much has changed routine wise except that in the last part of this year at 6.5 years old, Quentin has finally given up his afternoon nap. We now read on the couch with cups of tea and a blanket instead of him going to his room to nap. There have been enough memories in these few short years to last a lifetime. And trips to all the local museums and art galleries. Every Monday we would pack a bag and go. And along the way there was work mat after work mat of child chosen activities, fantastic games and pages being poured over. For two years we followed an absolutely fabulous Nature Study based on the book “Nature Anatomy”. 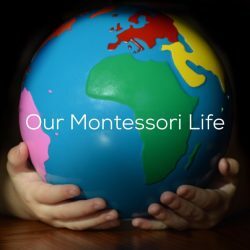 You can find our first monthly post here and the rest of the monthly studies in our website category Montessori Nature Study and Outdoor Activities. It really helped us find our way and gave us ideas that were easily doable where we live. As Quentin transitioned to the 6-9 classroom however our Nature Days have become more customized. He is able to really formulate research ideas now (check out our Instagram feed for his latest child led project) and gathers the materials himself. He finds a multitude of ideas on our nature hikes instead of preferring to stick to a solid theme. So why the formal end to it all? We are on the verge of a very big change. The Montessori 6-9 classroom in a small local Montessori school Quentin currently attends has been lacking and has regrettably not lived up to our standards. And so last month when his waitlist papers were pulled at one of the Montessori schools in our area that goes from the 3-6 classroom right through high school we jumped at the chance and took the spot. It will be a world of positive difference for him. And it means he will be able to stay in an authentic school Montessori environment until he graduates high school. And, it will mean, he attends five full days a week. The decision was an easy one. The school has (among many other positive features) a strong nature component. It is the right choice for him. Because of this as we prepare for him to start at the new school next Monday, today was our last official Nature Day. Of course it poured rain. And so we didn’t let that stop us, instead using our seasons passes to visit one of our favourite indoor paradises. The warm air filled with hundreds of butterflies was the perfect thing to take our minds off the rain and the upcoming transition. There was also a morning filled with the busy hum of a child who loves learning. So what does all this mean for us? Well for most of our days it will be very much the same. The school morning routine that sees us through the rest of the week will now start for Quentin on Monday. I will continue to consult with families and school and teach in my 3-6 classroom. It’s the little things that will change. We will need to be mindful of how even just one day can add to the overall load on a child and shift our expectations and observations to be sure to catch that. We will need to find time on the weekends to steal ourselves away into the woods and the shoreline and all of his favourite little hideaways. And above all, we will need to ensure that he has the time to keep that fire lit outside of school. To give him the opportunity to share his joy of learning whether it’s baking a new recipe or sitting down to trudge through the differences between Newton’s Law of Gravitation and Einstein’s Theory of Relativity when talking about things that are really big and very fast (because yes, he’s that six year old kid). I will also need to be prepared for him to miss it, this closeness we share on Mondays, but I also need to be prepared for him to not. And that perhaps is the most wonderful and most stinging part of it all. That wonderfully painful part of seeing your children grow up. Summer is my favourite time of year to be outside, and one of my absolute favourite places to be is surrounded by green an growing things. This includes stocking our bookshelves with our favourite books about gardens, food and where it comes from. A beautiful story of compassion set in a cold and wintry world where adults chase a lost fox away, and a young child brings it food and offers it shelter in a beautiful greenhouse full of flowers. “Fox’s Garden” found here is perfect for even the youngest child and older children love imagining the story in read-aloud sessions. We absolutely adore the Anatomy series by Julia Rothman. “Farm Anatomy” found here is a complete guide to all aspects of a farm from the machinery to planting to different kinds of barn doors. We love the ideas and recipes in it and the detail is second to none. It’s absolutely perfect for children beginning at 2 years as a vocabulary book and it remains a favourite well into the elementary years. “Eating the Alphabet” found here was one of Quentin’s favourites as a toddler. The vocabulary building opportunities are endless and the rich colours draw both the adult and child in. The children in my 3-6 Montessori classroom love it because it’s a great conversation starter for that age group around food, what you’ve tried and what you definitely don’t love to eat. For Quentin it’s tomatoes. We wrote about “Green Green: A community garden story” here when we showcased some of our community/allotment garden plot. We love community gardens. So many opportunities to connect with your neighbours, grow fresh food without the need for growing space at home and teach children about the food cycle. We love Elisha Cooper books. Of all of them this is our favourite “Farm” found here is a beautiful story that touches my heart and makes me homesick for my childhood days of hiding in corn rows and the smell of the hayloft. It follows the life of a farming family for one year and Quentin loves the rich detail. It’s best suited to children 5+. “Grandpa’s Garden” has been a favourite for years. We love Barefoot Books and this one follows a boy and his grandfather as they slowly wait for their garden to come to life. Barefoot has an excellent selection of garden and food related books for every age and their rich use of language and inclusive and diverse books keep us coming back. Do you have a favourite thing to grow in your field, garden or planter box? We’d love you to share it. If you’ve never tried growing vegetables, lettuce is an easy one and perfect for kids to grow. One year later after we wrote part one of this post here we are settling into our summer rhythm once again. And once again we are following the Montessori approach to home learning, which means we “follow the child”. So although there is always an opportunity to foster curiosity we don’t advocate for structured, academic summer home learning. Books and extension invitations are such a fun way for us to spend quality time together. These are some of our favourites this year. The Darkest Dark is a favourite Canadian read here. Astronaut Chris Hadfield recounts a story of his childhood of big imaginations, big dreams and being afraid of the dark. We love the illustrations and comical and relatable moments. It’s perfect for kids 3-6. Max and the Tag Along Moon is by the multi award winning Floyd Cooper. His soft paintings tell a gorgeous story of a small boy’s love for his Grandfather who reminds him that the same moon that shines over them together will shine over them when they are apart. Max watches the moon as it “tags along” all the way back to his own house. Perfect for kids 2+. We have written about some of our own favourite moon and space nature activities here. Straw painting is so easily accessible to children beginning around two years old. It requires nothing more than a straw and some coloured water. We have loved making constellations over the years. We also watch the Perseid Meteor shower every year in August. I have fond memories of curling up with Quentin in the back yard hammock, wrapped in a blanket, watching the streaks of light cross the sky. You can find all the details of that meteor shower here. If you aren’t in a great viewing location for this space event, research what you can see. Summer is the perfect time for star gazing. Up in the Leaves: The True Story of the Central Park Treehouses was recommended by our friend Fred Ted and Company. I’m so glad they did. It’s our favourite new book on our shelves. A true story of a young boy who lives in New York and dislikes the noise and crowds. He instead decides to seek refuge in Central Park and build tree houses. A book about following your passion despite what people may say, it is an excellent read for children 5 and up. Westlandia has been on our shelves for over a decade. It was our oldest’s absolute favourite as a young boy. Another story of a boy who doesn’t quite fit in and decides to follow his own path. There’s a reason it has stood the test of times in this house. Well written with extremely rich language and beautifully coloured pages, this story sparks imagination, follows the Montessori Great Lessons and ultimately showcases that it’s not only ok to be different from the masses; it’s essential. It is essential reading material for all children but especially those that feel like outcasts. Ideal for children 7+. Our own front yard tree house was there long before Quentin came along and gave both the boys so much fun. Anthony especially. He would spend summer nights up there, lantern light glowing through the window, curled up in his sleeping bag reading with a snack. Regrettably it had to come down earlier this year. Quentin was devastated as he was not yet big enough to climb the rope ladder independently. We will have to consider a rebuild when he is older. We keep all our Montessori compatible outdoor space ideas on our Montessori Outdoor Space Pinterest Board here. There is something for everyone from the beginner looking to bring in a little outdoor play to the advanced builder looking for their next project. We hope that you are having a relaxing, exciting and memory making Summer. The weather has changed here. Warmer days are teasing us with thoughts of Summer right around the corner. And so with our eyes on the skies watching and waiting, I had to snap up this beautiful new book. It’s by one of our very favourite authors Elly MacKay. A collection of weather sayings it’s absolutely perfect for any Nature Study or for children who love interesting facts. As with all her books the almost luminescent pictures tell a much deeper story. This one is of a family out for a camping adventure. We loved the facts that detail each of the sayings found at the back of the book and they would be excellent research topics for the oldest students in my 3-6 classroom. The book ends on the note that though traveling is amazing, there’s no place like home. If you haven’t had a chance to see the process Elly uses to make her artwork you can visit this video here. It’s a stunning. We hope you all are enjoying your weekend and have set aside some time to curl up with a good book. It’s no secret we have loved materials from Waseca Biomes for years. It started when Quentin was two with the Seasons Mat and Sun. He loved carefully singing the Seasons Song and laying out the corresponding cards. 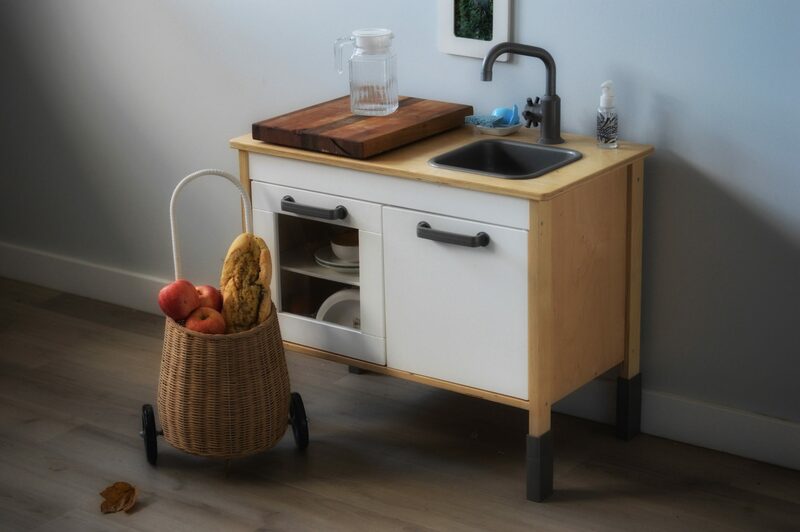 Our collection of materials has grown quite a bit over the years, and so when Waseca Biomes released their new series of materials we couldn’t help but jump at the chance to see them. It was incredibly fortunate that they happen to be a vendor at the 2018 American Montessori Association conference as I am also a attending. Seeing their materials laid out in entirety gives you a true sense of how they are integrated into each of the 5 areas of a 3-6 Montessori programme and one can also see how the sequence of the materials easily carries onward into the Elementary. The new Season’s Mat is amazing. Rounded with an extraordinary amount of detail, it clearly illustrates the subtleties in the changing of the seasons. There is also an update to the Water Cycle Mat (which will will do a later post about) and a brand new edition of a Rock Cycle Mat. This is going to be the perfect addition at our house and in my classroom as both have kids that are passionate about rocks. Finding materials that reflect your child’s passions help fuel future discussions and discovery. If you want to see the complete Rock Cycle Mat you can find all the photos and information here. As I’ve mentioned before in this post I love the opportunity to observe other Montessori Prepared Environments. Ashley Speed, the founder of Diamond Montessori is not only a personal friend, she is an AMI trained 3-6 Montessori Guide and our leading resource for inclusive children’s resources such as books, card materials and community resources. And so while I have been accessing her wealth of knowledge (found here on Instagram) I had yet to be able to observe in her own 3-6 classroom. It didn’t disappoint. The lighting was soft but surprisingly well lit considering the amount of rain streaming down outside in Vancouver. The shelves were orderly and well planned. However it was not the gorgeous set of bells nor the orderly shelves I had made the trip for. You see Ashley is a regrettably rare form of Montessori Guide. She fills her environment with her own passions down to the smallest detail. Her carefully crafted Museum full of rock, mineral and animal specimens calls to a child’s sense of awe and wonder. Her handmade wooden calendar and cultural cards invite a child so effortlessly to learn new concepts. Even the tiny porcelain drawers and handcrafted fabric pouches add colour and beauty to the space as well as practicality. All of this pays off. I arrive before the morning class does and witness the ease in which each child comes into the class, transitions into their indoor shoes and sets to work. Many choose cursive writing practice. The transition is not a lengthy nor a noisy one, and the classroom has been set up to provide enough walking space between the work tables allowing for ease of movement. One child chooses from the extensive Geography materials and sets to work finishing a local map. The hand felted solar system stored in the basket called to me and I wished I had longer to stay to work on it myself. January is often the time when schools in the northern hemisphere are setting their classroom rosters for September, and welcoming observations. If you have yet to observe an authentic Montessori prepared environment in action, now is often the time. Thanks to Ashley for allowing me to be part of her morning. I left very inspired.